Many supermarkets are now offering rewards and money back for customers who reduce, reuse and recycle. Post-Blue Planet II, the world has finally started noticing the staggering amount of plastic we chuck away. Initiatives like the mandatory 5p plastic bag charge have been successful in changing our habits, but many brands have also started offering cash incentives for recycling. It’s early days for these schemes, but if successful they could become commonplace in the future. 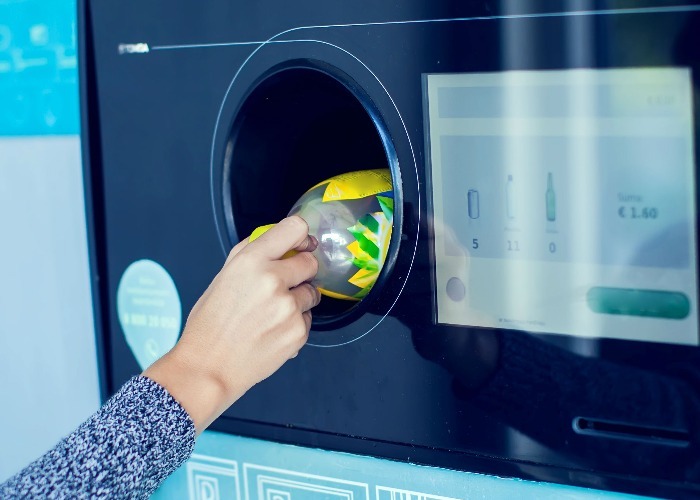 Joining Iceland and Morrisons in trialling a bottle return scheme, the supermarket will allow you to recycle plastic bottles for 10p a pop – up to the value of £1 each time. These ‘reverse vending machines’ allow customers to return bottles of up to 750ml in size. Since 27th September, the scheme has been running in five stores: Borehamwood, Swansea, Edinburgh, Manchester and Birmingham. Tesco is yet to announce the results of the scheme and whether it’ll be launched in other stores. Tesco also offers Clubcard points to customers for recycling empty ink cartridges. It’ll give you 25-125 points per cartridge. All you need to do is send them in a freepost envelope, which can be picked up in-store or online. Since October the store also allows customers to bring their own containers to deli counters in 700 stores, in a bid to cut down on plastic, although there’s no cash incentive for doing so. Championing the plastic bottle return scheme, Iceland has already handed out a total of £30,000 to customers. Recycling machines have been installed at five branches – Wolverhampton, Mold, Fulham, Musselburgh and Deeside – with an average of 2,583 bottles recycled per day. Iceland will give you a 10p voucher to spend in store for each bottle you return, although there’s a catch – the bottles must be purchased from Iceland originally. The frozen food retailer also made headlines with their palm oil advert at Christmas, which was banned for being ‘too political’. Iceland has promised to remove palm oil from all own-brand products and are also aiming to use 100% plastic-free own-brand packaging by 2023. However, it’s not going all that well: the BBC revealed that, rather than remove palm oil from 17 products, the store had simply removed the Iceland logo. In the meantime their labelling system lets you avoid excess plastic packaging. If you’re an Ocado shopper, you could make nearly a fiver simply by returning plastic bags. The grocery chain pays customers 5p for each plastic bag they return, accepting up to 99 bags at a time. Plus, it’ll accept bags from other stores too. Ocado reports that 87% of the bags they issue are returned through the scheme, proving its success. Although Morrisons is one of the best supermarkets for minimising its plastic usage, you won’t be able to make much money from it. That is, unless you live near its Skipton or Lindsayfield stores, where the company is trialling reverse vending machines much like Iceland and Tesco. The machines give customers 100 Morrisons More points per bottle, and you can exchange up to 20 bottles a day. On top of this, the chain has replaced plastic with paper bags for loose fruit and veg, and they allow you to bring your own containers to deli counters. Morrisons is trialling a 20p paper bag – a move which has been criticised, as paper is resource-intensive to produce and it must be used at least three times to be eco-friendlier than a single-use plastic bag. Read our guide to money-saving hacks at Morrisons. Waitrose might not be offering incentives to shoppers, but it is putting its money where its mouth is when it comes to plastic bag charges. Waitrose & Partners recently invested £1m from its plastic bag charge into ‘Plan Plastic – The Million-pound challenge’, a scheme which will invest in projects to tackle global plastic pollution. Waitrose also cut out disposable coffee cups from stores last April – although you can still grab a free hot drink with your shopping if you bring your own reusable cup, or you can buy one of theirs for £3. Like many supermarkets, Aldi has pledged to phase out non-recyclable plastics from own-brand products by 2022 and have already ditched non-recyclable black plastic trays (as pictured). The supermarket chain is currently conducting a ‘feasibility study’ into whether it could implement a Deposit Return Scheme for plastic bottles. But you’ll be hard pressed to get any money for eco-friendly behaviour, as there are no current cash incentives for recycling – although they do offer incentives in other countries, such as Denmark. You might be able to reduce your impact by shopping at Asda, as the firm is getting rid of non-recyclable black plastic trays, reducing cellophane wrap and thickness of plastic on many products. However, there are no monetary incentives currently. Lidl has also removed all black plastic (which is non-recyclable) from fruit and veg, plus it has replaced plastic trays for tomatoes and polystyrene pizza bases with cardboard alternatives. The budget supermarket has also completely stopped selling plastic bags – so if you forget yours, you’ll have to fork out for their raffia bags at 50p each. But while these plans may be effective in reducing plastic, the firm is yet to consider options for rewarding customers to incentivise being green. Lagging in the sustainability stakes, Sainsbury’s has a few initiatives to help customers reduce, reuse and recycle – but there’s no cash incentive yet. On the plus side, it has started using new airtight food cartons that use 85% less plastic.